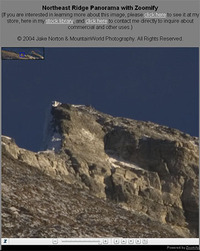 Home / The MountainWorld Blog by Jake Norton / Did Mallory & Irvine make it to the summit of Everest? I’ve posted quite a bit on this blog about the enduring mystery of Everest pioneers George Mallory & Andrew Irvine, and have been fortunate enough to take an active role in the story, going to Everest in 1999, 2001, and 2004 to search for clues and answers to this greatest of mountaineering mysteries. Unfortunately, in 1999, Graham fell ill with altitude sickness and was not able to take part directly in our discovery of Mallory’s remains on May 1. But, since then, he has taken a very active role in putting the pieces of the story together, including developing clothing replicas and returning to the mountain on several occasions. Just this week, Graham has unveiled a new theory on Mallory & Irvine’s final summit bid and generated much media attention in the process in conjunction with a presentation to the Royal Geographic Society in London. The crux of this theory, which puts Mallory & Irvine on the top of the world some 29 years before Hillary and Tenzin, hangs on Noel Odell’s final sighting of the pair high on the Northeast Ridge and conjecture that Mallory would have chosen to forgo the difficulties of the Second Step and climb instead below to the Third Step. While I, like Graham, believe Mallory & Irvine could have reached the summit in 1924 (and I like to believe they did reach the top, a theory for which I have no proof), I doubt Graham’s new theory really breaks any ground. If you take a good look at the interactive Zoomify panorama of the Northeast Ridge I put up on my website a while back – which shows the First, Second and Third Steps as well as the Summit Pyramid – you can see that bypassing the Second Step by traversing below it (which is the crux of Graham’s new theory) is not really a possibility. The daunting band of gray rock which forms the Second Step continues all the way to the Great Couloir with only a small gully breaking through just above the Second Step. And, given that this couloir is composed of down-sloping, rotten rock – characteristic of the upper North Face of Everest – I doubt this would be more feasible than the Second Step itself. Indeed Teddy Norton, on his attempt on June 4, 1924 with Howard Somervell, traversed below the Northeast Ridge crest trying to find an alternate way to the summit. He found no viable break in the rock bands bypassing the Second Step, and was eventually turned around at 28,165 feet in the Great (Norton) Couloir. Likewise, in 1933, Percy Wyn-Harris and Lawrence Wager eventually followed Norton’s traverse line after backing away from the Second Step and, as with Norton, found no viable passage through the gray band and onto the ridge crest. They turned around at nearly the same spot as Norton 9 years before. Days later, Eric Shipton and Frank Smythe tried the same route with the same results. George Mallory was a great climber, skilled, insightful, and clever. But, Norton, Wyn-Harris, Wager, Shipton, and Smythe were no slouches and if they could not find a route through the gray band, I doubt Mallory & Irvine could have fared better. So, while Graham’s theory is intriguing and brings this fascinating mystery back into the limelight, I unfortunately think it is but another theory. It unfortunately sheds no more true light on the story than Conrad Anker’s assertion that they could not have reached the top given the route challenges. As I have maintained since 1999, we now know far more about their final days and hours than ever before, but we still have no proof…No proof that they did summit, and likewise no proof that they did not summit. Anything proclaiming otherwise is simply conjecture. Did Mallory & Irvine reach the top in 1924? Yes I agree with your assessment of the route leading to the Great Couloir and I’ve been following this story of late with interest. observations based on your earlier zoom images you posted here in August from May 2004. Wyh-Harris & Wager tried to access in ’33. Long suggested as a ‘backdoor’ up onto the plateau, 2004 imagery reveals to my eye, very steep holdless rock, arguably as bad as the second step itself. To my eye, I simply can’t see a viable route from the couloir or its approaches up onto the plateau. Moreover even if is was achieved by M&I, WHY would they proceed up onto the third step (veering far to the left as they angled up the plateau from the Couloir), when they could gain the base of the pyramid at any juncture. Its seems excessive to veer so far over to the ridge crest when climbing up from the couloir and the pyramid looms above them accessable at any time. Some suggest fear of avalanche, but if so, then surely one could just skirt the third step perimeter to the right and avoid the step itself or simply continue up the pyramid right ridge to the north pillar. In note all pre war climbers tried to climb to the right and gain the subsidiary couloir too. Finally, M&I #9 cylinder was found on the first step approaches at 8475m, this seems to indicate ‘a priori’ an intent to gain the NE Arete, but if the couloir theory is cogent, then it would mean that at some point M&I changed their minds and opted for the couloir, following the Wyn & Wager traverse for instance. Possible but from my viewing of the terrain near and in the couloir, I’m somewhat sceptical. Thanks for these good images.